Show the world that they care about this problem and want it solved. Here and on our website, in perpetuity, we will list you and who you are honoring with your donation as a founding sponsor with our sincere thanks. Physicians can show the world that they care about this problem and want it solved. Here and on our website, in perpetuity, we will list you and who you are honoring with your donation as a pioneer sponsor with our sincere thanks. Your physician group will receive private demonstrations of the product and be placed on the top priority on our customer list. The Center for Disease Control (CDC) believes that of the 800,000 Americans who die each year from cardiovascular disease, at least 200,000 of those deaths are preventable. Their guidelines for saving 200,000 people a year starts with the creation of electronic patient management systems, team-based care, community prevention strategies, and the implementation of automated reminders from doctors to patients. 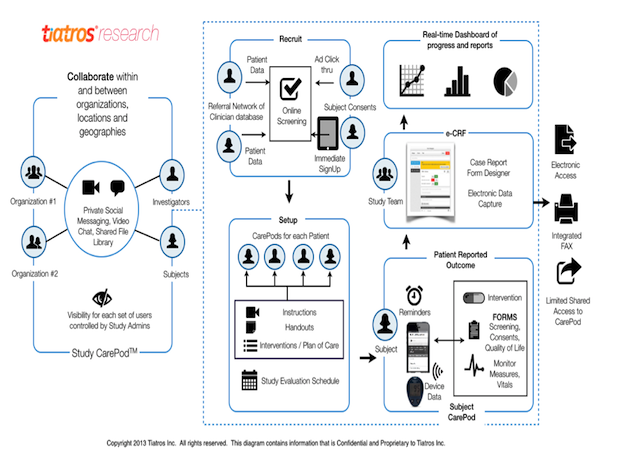 Tiatros is the electronic care coordination system the CDC is dreaming of. 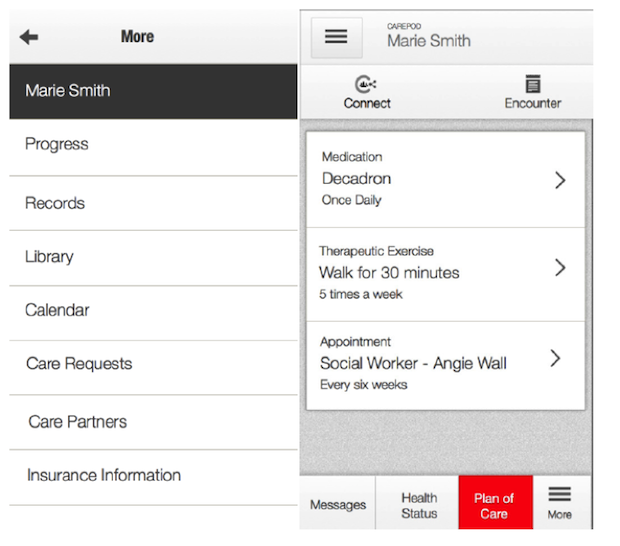 Tiatros brings care coordination into the 21st century. Tiatros is a scalable, cloud-based, HIPAA-compliant, social network-styled software platform that enables collaborative, patient-centric care services. Care services are managed within a private and secure mobile health cloud called a “CarePod.” The members of a patient’s CarePod have reliable and appropriately controlled access to each other, to the patient’s health records, and to useful, real-time health data sets. 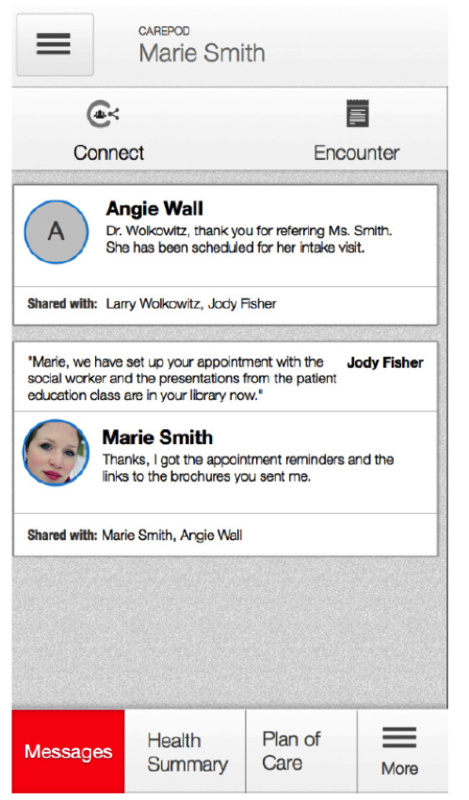 A workflow engine supports reminders, notifications, macro and micro surveys, reporting, and patient interactions. In Tiatros, all of the primary care physicians, specialists, nurses, administrators and family members are organized around the patient in their CarePod. This insures that all of the stakeholders in the patient’s care have access to all of the patient’s medical records, information, decisions and each other, on any Internet-enabled device. In Tiatros, new patients can complete assessment instrument, e.g. 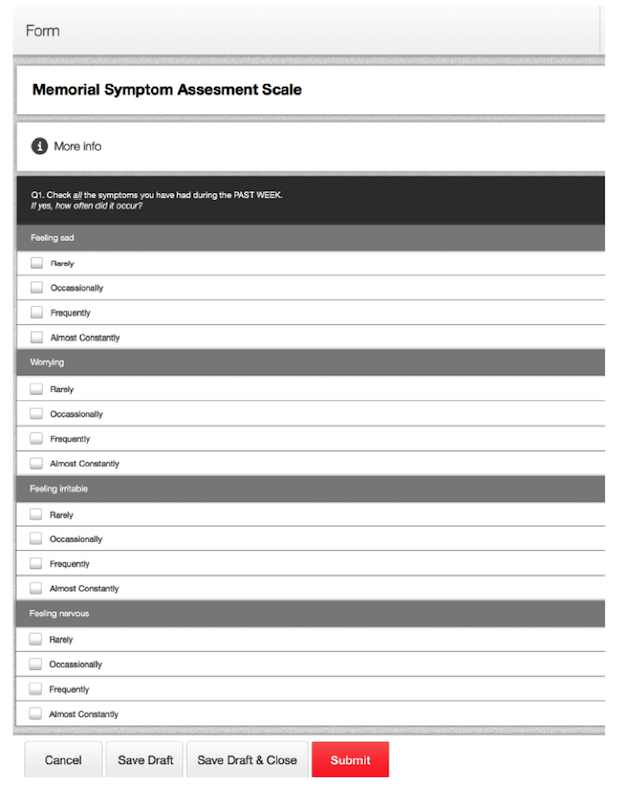 Memorial Symptom Assessment for cardiovascular health. This and other instruments may be use at the hospital, or from the patient’s home computer or mobile device. The patient’s caretakers, working together as a team in the patient’s CarePod can now create a care plan for the patient. Over time, they can also track the patient’s adherence with the treatment plan, follow their health progress, and keep all other members of the CarePod informed of changes or updates to the patient’s care plan. Care coordinators can also perform evidence-based protocols during the course of treatment. 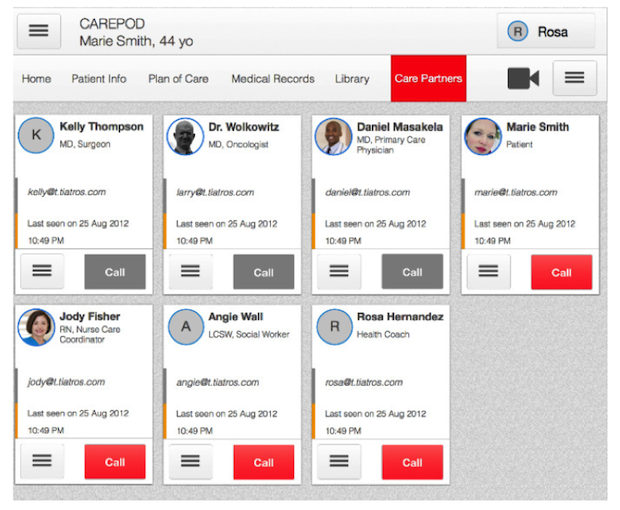 In Tiatros, care plan activities are easily scheduled and workflows automatically tracked. This provides a centralized record of all communications and data collection, making everyone in the CarePod fully informed and giving them access to the information they need to make decisions. Patient education materials, instructions, and plans are delivered to the patient, family, caregivers and are available in the patient’s private library. Attached to this document is a journal publication by the UC Davis School of Nursing entitled: A Novel Personal Health Network for Patient-Centered Chemotherapy Care Coordination. In the paper, the researchers discuss the launch of a pilot study to use Tiatros to improve health outcomes for chemotherapy patients. It is a pilot study similar to what we are proposing for the prevention of cardiovascular disease. Like the UC Davis team, we propose to conduct a field trial of Tiatros in order to assess usefulness and usability for a larger scale clinical trial. Tiatros is currently deployed across the 5 University of California health campuses in numerous research and care settings. In 2014, the Tiatros platform will be leveraged for a cancer care coordination program at UC Davis and with a psychiatric care program at UCSF. There will also be a joint program using Tiatros within the Fetal Treatment Consortium across all campuses targeting for a clinical trial. Lastly, Tiatros will be used with the UCSF Device Consortium, connecting with patients and studying the impact of innovative and connected patient devices. Tiatros fully empowers patients to be active participants in their care. By placing them back at the center of care, patients have access to all of their medical records, information and plan of care on any internet-enabled device. Cardiovascular patients can benefit from active engagement with their care teams and active participation in improved care coordination. Treatment typical requires the patient to develop relationships with multiple care team members who must also communicate effectively with one another, and to receive care at multiple locations. Optimal care requires that the patients and their family members be able to access care coordination capabilities in their usual environments, such as home or work, and to diverse care team members in various clinical settings. Tiatros supports physicians with technology-assisted, direct engagement of patients that provides a unique and highly effective channel to collect information directly from their patients. 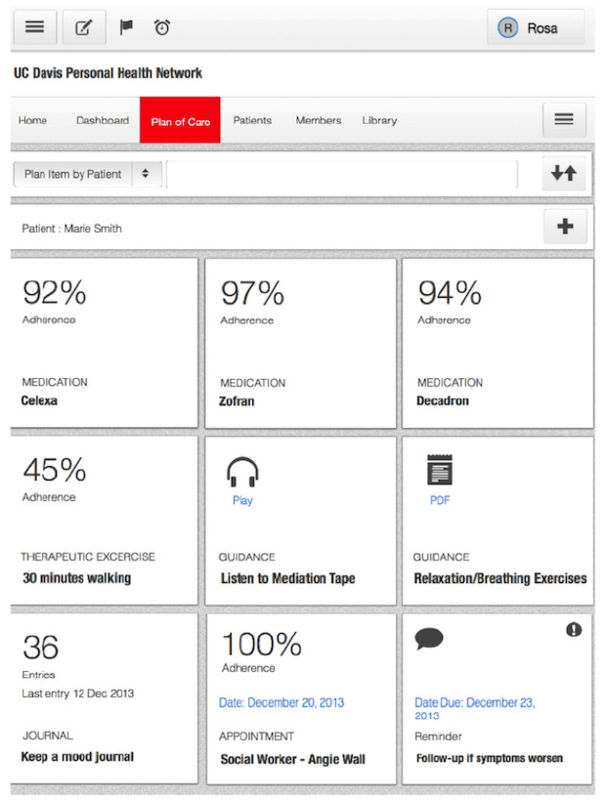 Customizable queries can be automatically delivered to the patient’s phone. The patient can respond quickly and easily using her or her phone. 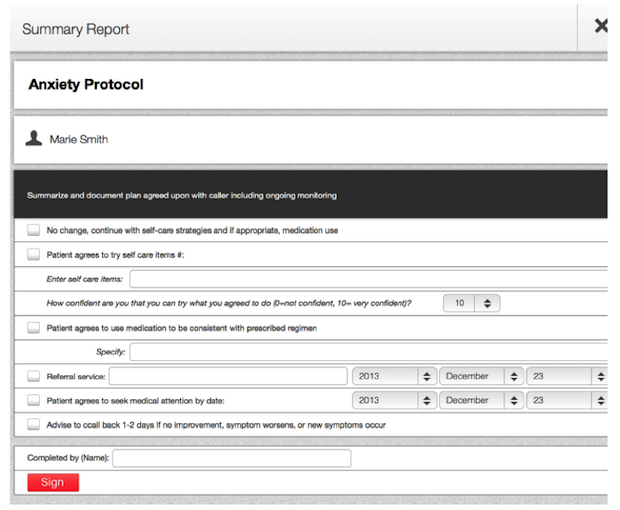 Responses are displayed in customizable formats that are useful to clinicians. Health data is aggregated around patients, instead of around departments, units or locations. In this way, patients can be followed continuously across the full spectrum of care. Physicians are empowered to make decisions with the confidence that they have a complete picture of the patient’s medical records, information and ongoing treatment. We will use this money to run a field trial of Tiatros as a cardiovascular disease management tool with the UC Davis nursing team.